Board Babe is a 5-reel 9-Payline video slot game that includes a Bonus game, scatters and wilds. The coin selection is from one cent to $50. The jackpot is 2500 coins, which could be $125,000 if the maximum bet of $450 on one spin. The Bonus Game is triggered when the snowflake scatter image appears on reels one or five. This slot is easy to play and has a generous jackpot potential. 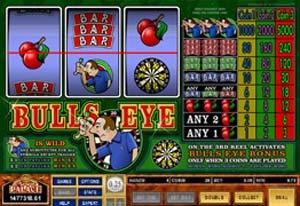 Bullseye is a 5-reel 9-Payline video slot game that includes a Bonus game, scatters and wilds. This slot should not be confused with one put out by Microgaming with a similar name. The theme for this slot game is from an old UK TV show that was seen from 1982 to 1993. The reviews on the net are not very enticing. 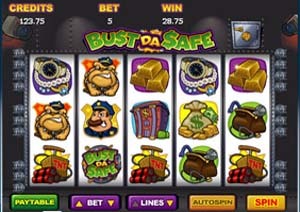 Bust da Safe is a 5-reel 20-Payline video slot game that includes a Bonus game, free spins, scatters and wilds. The selected coin values range from one cent to $50, with a potential jackpot of 2500 coins. A possible $1000 per spin makes this game a high rollers game. This is too rich for the possible jackpot of only $125,000. The free spins are triggered when the Vault symbol shows on reels one or five. The free spins cannot be retriggered during a free spin. Cash Cruise is a 5-reel 9-Payline video slot game that includes a Bonus game, Cash Flash Jackpot, scatters and wilds. 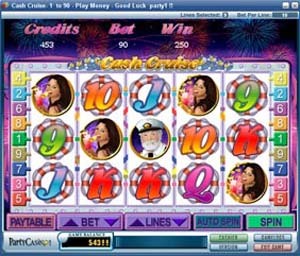 The theme of this slot game is an elegant cruise ship and the passengers. There is a random progressive jackpot. The coin value can be selected from one cent to $10. The jackpot is 5000 coins. The max wager of $90 gives the player a shot at a $50,000 jackpot. 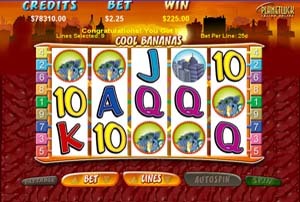 Cool Bananas is a 5-reel 9-Payline video slot game that includes Bonus spins and wilds. The selected coin values range from $1 to $20 with a 5000-coin jackpot. This results in a possible jackpot of $100,000 on a max wager of $180. The theme of this slot is the cool life of a monkey. 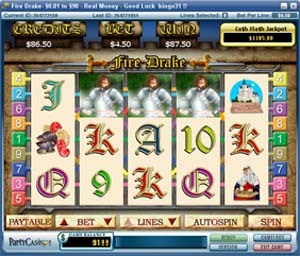 Fire Drake is a 5-reel 9-Payline video slot game that includes a Bonus game, scatters and wilds. The coin values can be from one cent to $10 with a possible jackpot of 10,000 coins. This results in a jackpot of $100,000 on a maximum wager of $90. This is an excellent return on a wager. 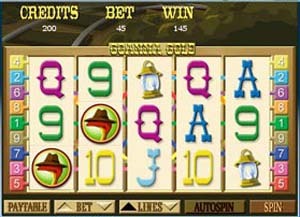 Goanna Gold is a 5-reel 9-Payline video slot game that includes a Bonus game, scatters and wilds. Wagers are in coins with a value range of one cent to $10 each. The top jackpot is 20,000 coins. This could result in $200,000 jackpot for a $90 wager. This is a very good possible return on this wager. The bonus game gives the player an additional way to win on this slot. 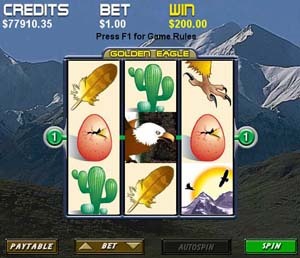 Golden Eagle is a 3-reel one-Payline video slot with wilds. This is one of the classic slots that are available online. The coin range is from one cent to $10 with a possible jackpot of 1000 coins. This classic slot has almost double the number of winning ways when compared to other classic slots. This gives any player more chances of collecting from any spin. 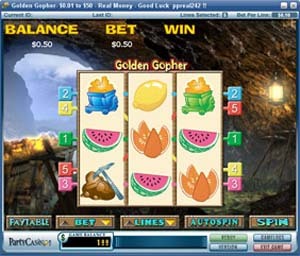 Golden Gopher is a 3-reel one-Payline video slot with wilds. This slot in another in the classic mold of old time slots. 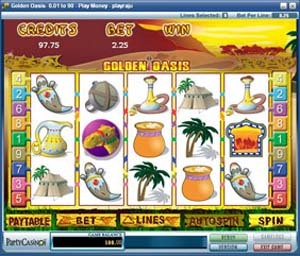 Golden Oasis is a 5-reel 9-payline slot with a Bonus Game, Cash Flash and wilds. The coin wager can be with coins valued at one cent to $10. The jackpot can be as high as 10,000 coins. This means a $90 wager could win $100,000. This is an excellent risk/reward ratio. The bonus game is triggered when three or more camel images appear anywhere on the screen. 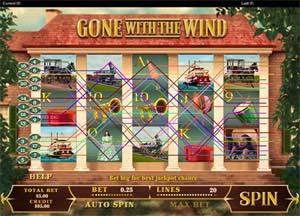 Gone With the Wind is a 5-reel 20-payline slot with free games, wilds and scatters. This slot game reminds the player of the classic movie that is also known as GWTW. The famous characters of Rhett, Scarlet, steamboats and horse drawn carriages, along with other images of that bygone Civil War era are prevalent on this slot game. The coin value can be selected from one cent to $10. Lovers of this grand old movie and the Civil War history will like this game. 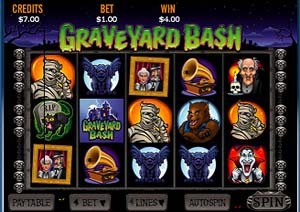 Graveyard Bash is a 5-reel 20-payline slot with a Bonus Game, Free spins, wilds and scatters. The player selects the value of the coin to be bet. This ranges from one cent to $50 with a possible jackpot of 2500 coins. The Bonus Game is triggered when three or more gargoyle images appear on adjacent reels. If the maximum were wagered the value of the jackpot would be $125,000. 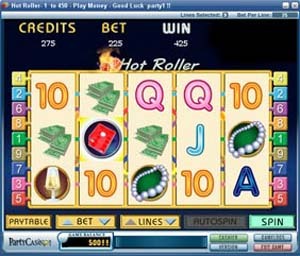 Hot Roller is a 5-reel 9-Payline slot that includes a Bonus game, scatters and wilds. A player can select the value of coins from one cent to $50 per coin. The maximum wager on this slot per spin could total $450. If two dice appear on a spin, they are rolled and if a pair comes up then the Bonus Game is triggered. 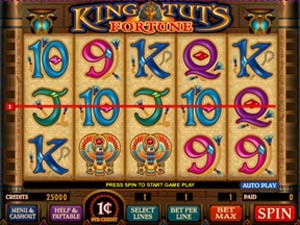 King Tuts Fortune is a 5-reel 20-payline slot with a Bonus Game, Free spins, wilds and scatters. Selected coin values range from one cent to $50 per coin. The maximum Jackpot is 2500 coins. Free spins are triggered if the Fire Torch symbol appears on reel one and five. The number associated with each symbol is added together. This gives the total number of free spins. 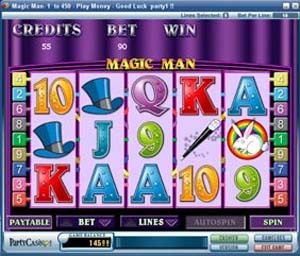 Magic Man is a 5-reel 9-payline slot with a Bonus Game, wilds and scatters. Selected coin values range from one cent to $50 with a possible maximum jackpot of 12,500 coins. This would mean a whopping size jackpot if the player had wagered the maximum of $450; the jackpot would be $625,000. The bonus game is triggered if three or more Rabbit images appear on any of the reels at the end of a spin. This bonus game can payout a significant amount of cash depending on the wagered amount on this spin. 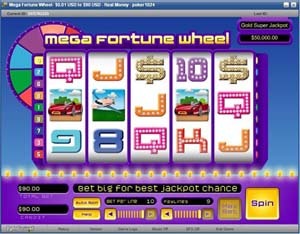 Mega Fortune Wheel is a 5-reel 9-payline slot with a Bonus Game, wilds, scatters and is a progressive slot. The coin value is selected from one cent to $10 per coin. Mega Fortune Wheel has a progressive jackpot as well as a second prize of 5000 coins. This slot is more inline with some of the bigger jackpot slots that are now available online. 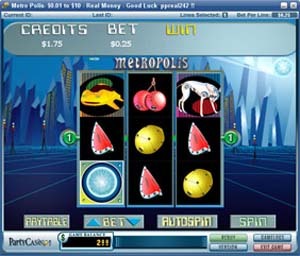 Metropolis 3-reel one-payline slot with wilds. This is another of the old time classic like slots. The coin value can be one cent to $10 and the play is for one coin. The jackpot is 2500 coins and there are 16 winning combinations, which is on the high end of these classic slots. 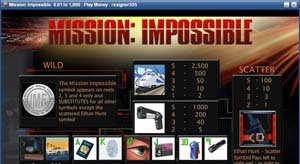 Mission Impossible is a 5-reel 20-payline slot with a Bonus Game, Free spins, wilds and scatters. The wager in coins can be from a one-cent value coin to a $50 coin. The jackpot is 2500 coins and there are 25 winning combos on the 20 paylines. The free spin cannot be retriggered during a free spin. Three or more Ethan Hunt symbols depending on the placement can trigger the Bonus Game. Piggy Payback is a 5-reel 9-payline slot with a Bonus Game, wilds and scatters. There are 30 winning combinations that can show on any of the nine paylines. The coins can have a value of one cent to $10 per coin. A player can win a maximum jackpot of 5000 coins. 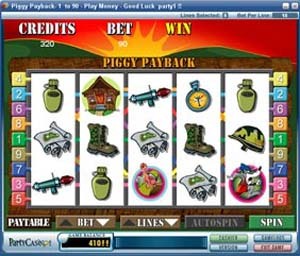 The Bonus Game is triggered when three or more Pig symbols appear on any of the reels. Predator is a 5-reel 9-payline slot with a Bonus Game, wilds and scatters. The coin values can be one cent to $50 per spin with a jackpot of 10,000 coins. There are 38 winning combinations possible on each spin. The Bonus Game is triggered when three or more Savannah symbols appear on any of the reels after a spin. 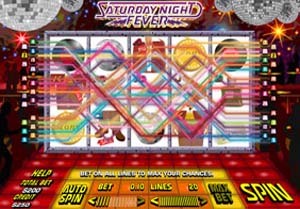 Saturday Night Fever is a 5-reel 20-payline slot with a Bonus Game, Free spins, wilds and scatters. This slot has 39 winning combinations that could appear on any of the 20 paylines. Coin value can be selected from one cent to $50. A maximum jackpot is 2500 coins on any spin. The Bonus Game is triggered when three or more Trophy symbols appear in the correct order on the reels. 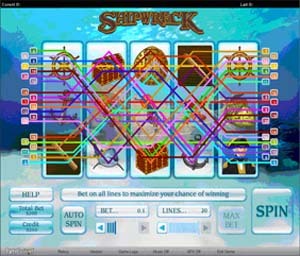 Shipwreck is a 5-reel 20-payline slot with a Bonus Game, wilds and scatters. Coins played per spin can have a value of one cent to $50 per coin. A maximum jackpot can total 2500 coins. Three or more Helmet symbols that appear on adjacent reels triggers the Bonus game. The theme of this slot is about ships and shipwrecks on the bottom of the sea. 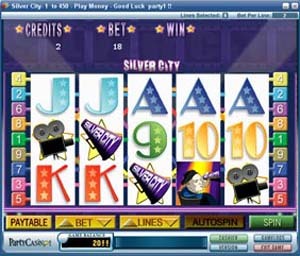 Silver city is a 5-reel 9-payline slot with wilds and scatters. The coins can be valued at one cent to $50 per coin. The player can also select the pay lines they wish to play on any given spin. The wild image is The Actress. 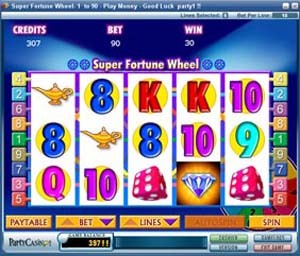 Super Fortuna Wheel is a 5-reel 9-payline slot with a Bonus Game, wilds, scatters and is a progressive slot. This slot game while it is a progressive is very simple and lacks the pizzazz that most progressive have. Other reviews are less than complimentary about this slot. 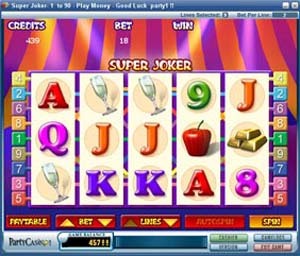 Super Joker is a 5-reel 9-payline slot with a Bonus Game, wilds, scatters and is a progressive slot. Select the coin value from one cent to $10. The jackpot can be won on any payline with a value of 10,000 coins. This possible jackpot is a decent risk vs. reward even if the maximum value for the coin is played. 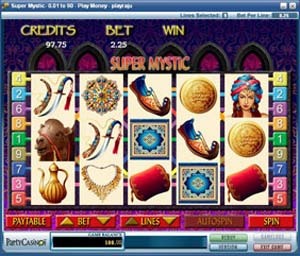 Super Mystic is a 5-reel 9-payline slot with a Bonus Game, wilds, scatters and is a progressive slot. Select the coin value from one cent to $10. The jackpot can be won on any payline with a value of 6,000 coins. This value of jackpot does not reach the amount of some better progressives. 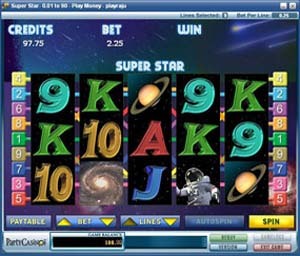 Super Star is a 5-reel 9-payline slot with a Bonus Game, wilds and scatters. This slot game has 29 winning combinations Selected coin value ranges from one cent to $10 with a jackpot of 10,000 coins. 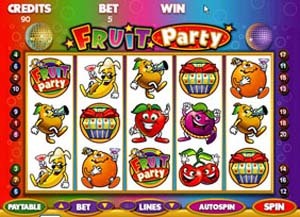 There are also other jackpot rewards associated with this interesting slot game. The theme of this slot is space and the images carry out this idea when the game is played. Sweet Hawaii is a 5-reel 9-payline slot with a Hula Feature, free spins, wilds and scatters. With 40 winning combos this slot gives the player a better chance of a winning spin. The coin values can be selected from one cent to $10. The jackpot is 5000 coins as a minimum. If the Hula Girl appears anywhere on reel three the Hula Feature is activated for play. 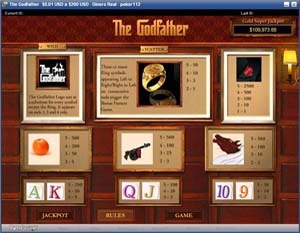 The Godfather is a 5-reel 20-payline slot with a Bonus Game, free spins, wilds, scatters and is a progressive slot. The winning spin combinations total 39, this is a high number and gives the player a chance to win on any spin. The coins can be valued at one cent to $10. The jackpot is 2500 coins at a minimum. Three Gold Rings depending where they fall on the reels will trigger the Bonus Game. 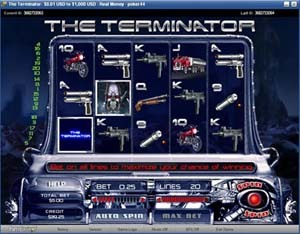 The Terminator is a 5-reel 20-payline slot with a 2xBonus Game, free spins, wilds and scatters. The coins can be valued at one cent to $5. The jackpot comes in at 10,000 coins. When three T800 Head images appear on any of the reels the Bonus Game is triggered. With free spins available and the wilds and scatters, this slot has a lot going for it and gives the player an interesting game. 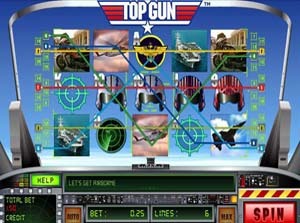 Top Gun is a 5-reel 20-payline slot with a Bonus Game, free spins, wilds and scatters. The coins can be valued at one cent to $50 per coin. The jackpot is 10,000 coins. This game has 38 winning combinations that a player can get on any of the paylines. The Bonus Game is triggered when three F14 images appear on any of the reels. The free spins are triggered randomly. 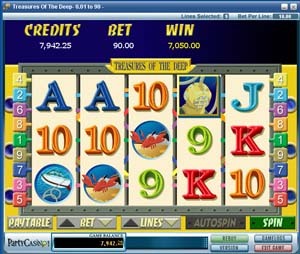 Treasure of the Deep is a 5-reel 9-payline slot with wilds and scatters. The coins can be valued at one cent to $10 per coin. The theme is stated in the name and all images have to do with finding the treasures of the deep part of the sea.